A Tottenham signing. In January. Before deadline day. An under-21 full international player, even. holtby’s early arrival could mean tottenham will have a crazy transfer deadline day. or not. Pardon me for a moment while I dislodge this tongue I just accidentally swallowed. Though he had already agreed to a pre-contract deal for summer arrival at White Hart Lane, the sight of Lewis Holtby holding up a shirt with Villas-Boas at Spurs Lodge a full six months early was a welcomed surprise. A sought-after, rising talent joining Spurs in a window where market value for players is generally grossly inflated? Color me pessimistic, but I hadn’t expected an announcement of this kind this January. Our chairman, David Levy, just doesn’t operate that way. 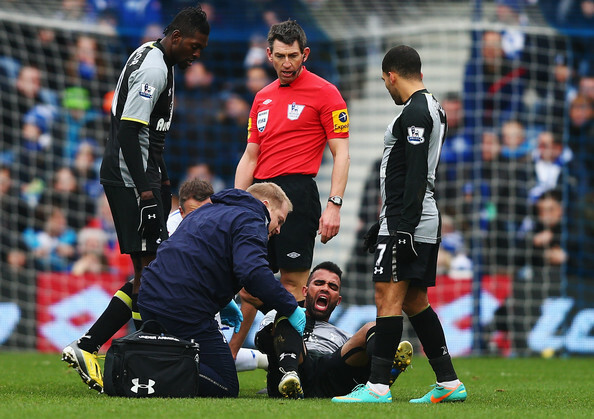 Put simply: this month is often a barren one for Spurs transfer activity. At least when it comes to what I’d like to define as “legitimate” signings. Sure, Louis Saha and Ryan Nelsen joined last winter. Both were on frees; typical Levy business. But Saha is now “on trial” with Crystal Palace after not cutting it at Sunderland this season, and Nelsen is jumping ship at QPR for greener pastures as an MLS coach. So, it’s hard to call either a legitimate signing since neither is doing anything of note just a year on from joining the Lillywhites. Two winters ago was a similar story, with Steven Pienaar and Bongani Khumalo providing limited impact in their time with the club — though Steven Pienaar should have been more impactful. In fact, you have to go as far back as the 2010 January window before you find signings of any importance in Younès Kaboul and Niko Kranjčar. I understand Levy’s frugality and its importance to the club’s bottom line. We’ve got a stadium to build and Financial Fair Play to mind, after all. But this window, just as was the case last year at this time, appears absolutely critical to Spur’s lofty ambitions for the season. While I won’t go as far to say our inactivity last January is wholly to blame for Spurs missing out on the Champions League this year, there’s no doubt it surely played its part. So given that January is normally a month of near hibernation when it comes to player acquisitions, Holtby’s earlier-than-expected arrival was a major boost to fan moral. sandro’s injury helped pave the way to holtby’s arrival. So why did we sign him now? Make no doubt about it, Lewis Holtby is the “João Moutinho Plan B”. He roughly plays the same role (creative midfield spark), is younger and – most importantly when it comes to Levy signings – significantly cheaper. With his capture now finalized, I would be shocked if we made any further attempts at the long-sought after Portuguese playmaker. That’s not to mention the fact that Holtby’s only here right now due to immediate need: had Sandro not gone down for the rest of the season, it’s likely Lewis would have joined us in the summer as originally planned. Levy doesn’t spend money when he doesn’t have to, and though £1.5 million for a player of his pedigree is a steal, “free” in the summer probably suited the chairman’s tastes better. That said, he’s ours and ours now. Which is a good thing. The under-21 Germany captain posses the guile to unlock the parked buses that tend to prevent Spurs from capitalizing on all of their possession. His last performance in Schalke blue was explains just why he’s so hyped: two assists, a goal and a standing ovation from the Veltins-Arena. Whether Lewis lives up to the fanfare remains to be seen, but if he can, he’ll be a key player for Spurs for years to come. As tonight’s 20-minute debut suggested, André will probably bleed him into the squad slowly, just as he did with Lloris. But Holtby is clearly destined for the starting XI. Many of Spurs’ newest fans might find this to their chagrin, however, as the man most likely to make way for the young German is American star Clint Dempsey. That’s a bit harsh on Deuce considering his recent form, though a competition from Holtby might be what the Texan needs to raise his game once again to maintain his place in the side. It is a bit puzzling, however, that Spurs chose to reinforce the area of the squad that likely needs the least reinforcing. And by puzzling I mean, Why do we always do this?!?!?! With central midfielders in surplus even after Sandro’s injury (Dembélé, Sigurðsson, Parker, Huddlestone, Livermore, Tom Carroll and Jenas), at least one will have to go to keep pitch time and egos in check. I also would have thought other areas of the pitch would have been the targeted for strengthening first. Cough cough striker cough. But seriously, Levy, buy a striker. Even with a million midfielders on the pitch — creative ones, passing ones, dribbling ones and aimless ones — the apex of Tottenham’s attack is still the most deficient portion of the squad. Though I have to admit, I’m pretty foolish for thinking Levy will come through. I’ve been fooled one too many times by the naughty ITK promises and backpage whispers to fall for that again. 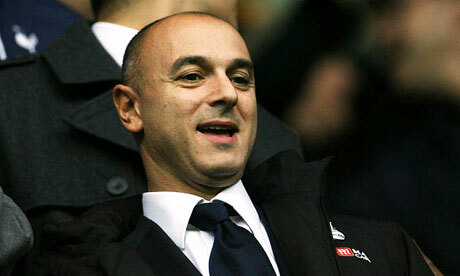 levy chuckles as the rest of us stress out while over analyzing his decisions. I wasn’t expecting Holtby this window, and he played 20 minutes tonight. If that can happen, anything can. Maybe Levy’s changing. Perhaps he’s on the attack now, sticking it to fellow chairmen/sporting directors while pillaging their finest talents for pennies! Maybe that one tweet I saw from that one guy about Damião could have some truth in it after all. We’ve been waiting for the perfect time to nab him. And if not him, Gary Hooper. For sure, one of the two. I mean, Levy’s pulled off deadline transfer surprise swoops before. Bagging Holtby in January shows he’s willing to make moves again. And he’s still got money to spend because the German kid was cheap! There’s 24 hours left before this January transfer window slams shut, and this time… this time things are going to be different.